That huge massive jade stone was found lying about 40 feet in the ground. .Now it is being drugged to totally and come into shape to be seen its imperial jade beauty. It can be known as the jade dragon partly because it is the worlds largest jade stone but chiefly its rare find of good quality and weighs over 3000 tons. It is seventy (70) feet long, 20 feet high and 16 feet wide. Its crystal composition is smooth and delicate as it is Jadeite jade. The colour ranges from white to purple, blue and deep green. There's also many dykes very promising to be the precious ones. The Ruby Dragon Jade & Gems Company Welcome heartily to those who proudly want to see the jade Dragon Phakant Region if they have a mind to. You can have a good choice for any kinds of jade jewellary. The finding of the great jade was reported to national race leader U Aung Kham Hti and he said it should be owned by the State, that it should be donated to the State and that the State, the whole people and the generations to come should own it as an historic gem. As the State accepted the donation, national race leader U Aung Kham Hti and the national people delightfully donated it to the State, he said. Chairman of PaO National Peace Group U Aung Kham Hti explained purpose of the donation of massive jade dyke. He said: Head of State Senior General Than Shwe has guided that as our country is rich in natural resources including land and water resources, the nation will develop when all the citizens work hard with goodwill. Secretary-1 Lt-Gen Khin Nyunt also has mentioned that Myanmar is endowed with various kinds of precious stones, Phakant region is well-known for jade mining and it can contribute towards the progress of national economy effectively. Myanmar has discovered a raw jade stone weighing 115 tons at Phakant mining area in the country's northernmost Kachin state, the local Newsweek journal reported Friday. 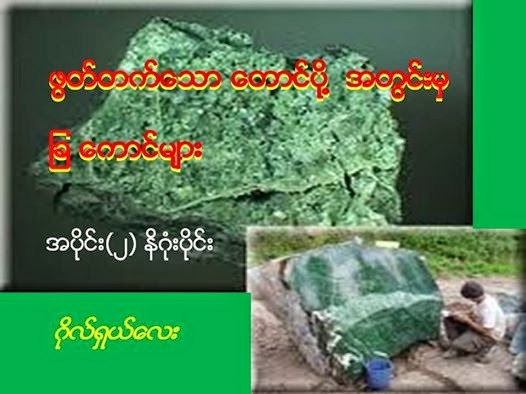 The jade stone, the second largest one to be mined in the past decade, was excavated by Max Myanmar company, the report said. The world's largest jade stone weighing about 3,000 tons was discovered in Phakant in 2000. The giant jade stone, measuring 21 meters long, 4.8 meters wide and 10.5 meters high was found at a depth of 12 meters underground, an earlier report said. The country also claimed that it possesses the world's largest ruby weighing 21,450 carats, the largest star sapphire weighing 63, 000 carats, the biggest peridot weighing 329 carats and the biggest pearl weighing 845 carats. 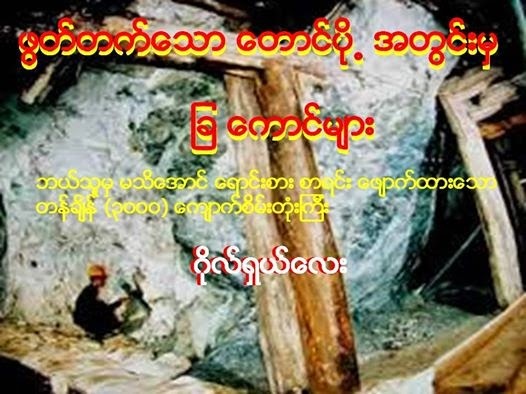 There are six mining areas in Myanmar under gem and jade exploration, namely, Mongshu and Namhyar in Shan state, Mogok in Mandalay division, Khamhti in Sagaing division, Moenyin and Phakant in Kachin state. Myanmar, a well-known producer of gems in the world, boasts ruby, diamond, cat's eye, emerald, topaz, pearl, sapphire, coral and a variety of garnet tinged with yellow. The government's Central Statistical Organization revealed that in the fiscal year 2008-09, Myanmar produced 32,921 tons of jade and 18,728 million carats of gems which include ruby, sapphire, spinel and peridot, as well as 201,081 mommis (754 kilograms) of pearl. “ ဖြတ္တက္ေသာ ေတာင္ပို႔အတြင္းမွ ျခ ေကာင္မ်ား” ေဆာင္းပါးအား တင္ျပရျခင္းသာ…………..